An Unentangled Knowing – Lessons in Training the Mind is Upasika Kee Nanayon, who wrote by the name Acharn Kor Kaho-suan-luang, is one of the most respected women teachers of Dhamma in modern Thailand. 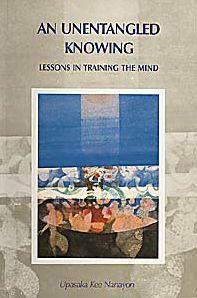 The teachings in this book, drawn from her talks and poetry, deal with a wide range of issues in the training of the mind. In addition to covering techniques of meditation, such as mindfulness of breathing and the contemplation of the body, they go beyond technique to deal with habits of the meditator’s heart. It is good to have free pdf copies on the Buddhist teachings by renowned Rimpuchis & His Holiness the Dalai Lama. This is an act of great merit which will benefit all humanity & eventually all sentient beings. I look forward to a free pdf on the institution of the Dalai Lama; from the first Dalai Lama till the present 14th Dalai Lama.